Two years ago, when my sister and I had both moved out of our parents' house (at 24 and 26, respectively--no shame) and into our own homes, we decided to start a new Christmas tradition: the Christmas Progressive Dinner. While, at first glance, seem to be a dinner where we all get together and discuss the direction of politics, culture, and technology, the reality is far less sophisticated (at least in our case: you totally make your dinner your own!). We use it as an excuse to get together during a very busy time of the year and stuff our faces. 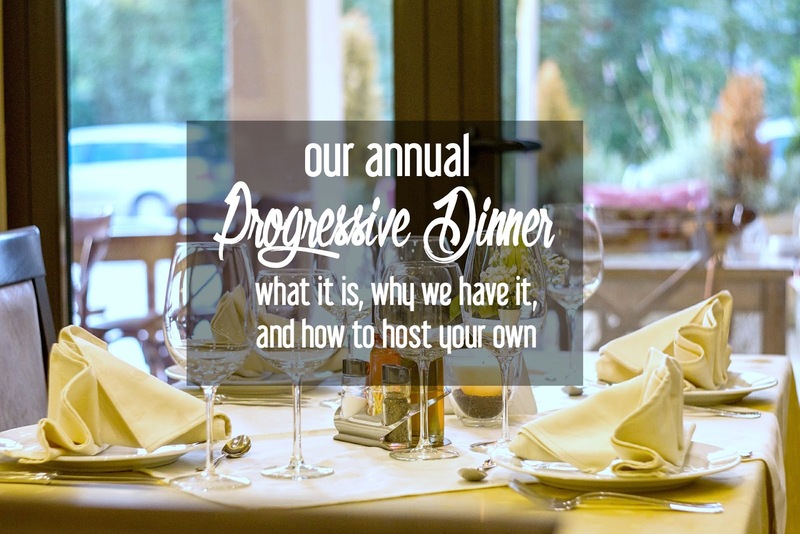 For some people, a progressive dinner is where you start at one house for appetizers and drinks, head to another for the entree, and a third for dessert. This is probably the traditional interpretation of the progressive dinner party, but we're anything but traditional. For us, the Christmas Progressive Dinner is basically a series of back-to-back extravagant dinners in each of our homes. We sign up for different days, and on our selected day, we make dinner for the other members of our family. In other words, it's a week long extravaganza of tastings and samplings and delicious food. We take the traditional idea of a progressive dinner and stretch it into a progressive dinner week. It all leads up to the big Christmas Eve meal at my mom and dad's house, which makes for a nice end cap to the experience. I love it. Not only do I get to skip cooking for several days around the holidays (ain't nobody got time for that), I take some of the pressure of my parents who used to cook the only big Christmas meal. We all are more relaxed. The dinners are so much fun because we try to out-do one another with new recipes, appetizers, fun drinks, and decor. This year, we had an addition to the dinner progress since my grandma wanted in on it. Since moving away from her home after my grandfather passed away before Thanksgiving, we've been trying to get her as involved in life down here as possible. She was super excited about being on the tour of dinners, and we were glad to include her. It also doesn't have to be at Christmas, though that's when we're feeling festive. Other progressive dinner party ideas could include a casual meal during the summer with a BBQ, during the fall and include s'mores by the campfire, or in early spring as a way to break up the monotony between Christmas and the warm weather. The progressive dinner idea would also be SO much fun to do while you're in a new city: go to one place for cocktails, another for appetizers, then sit down at a great restaurant for dinner, and end the night walking around town with an ice cream cone. You could do a mini culinary tour anywhere you are! What should you cook for a progressive dinner? If you're doing a traditional progressive dinner, you'll definitely want to coordinate with the other members of the meal train since you don't want to have jarring flavors or competing culinary experiences so close together. There are lots of fun ways to link a traditional progressive dinner together: you could do an all-Moroccan theme (and have a Moroccan Christmas like in The Office), you could do traditional English Christmas food (and return to the years of ye olde Henry VIII with wassail and mincemeat pies), or you could try a black-tie optional approach (i.e. dress up in fancy clothes and parade through the neighborhood as you sample delicacies at each house). 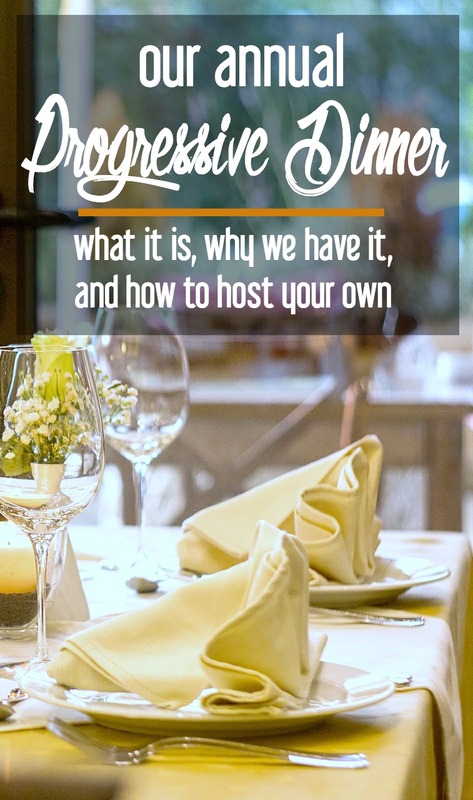 If you're planning on including multiple houses where guests are staying just 20-30 minutes each, you'll want to consider how easy it will be to carry the food with them if they're not done. Do you want guests to have finger foods? Or, would you rather serve them small portions of many things over the course of the night? Deciding on sit-down meals versus grab-and-go foods is an important distinction that you'll want to cover with all of the hosts involved. For our extend-a-progressive-dinner, each household involved will plan a meal with cocktails, appetizers, an entree, and dessert. (There's usually a theme still involved.) Sometimes, we go fancy, sometimes the entire menu is a surprise to the guests. But it's always a lot of fun since we each try to make dishes that we typically don't have or are too labor intensive for regular family get-togethers. This past year, Landon and I kicked off the series on the Saturday before Christmas with a casual red-and-white themed dinner. I broke out my (small) Spode Christmas collection, and we ate dinner in style. My dad loads up on deliciousness. And that's it. Major fail on my part. I was so busy running around making sure that people had food and drink refills that I didn't even pick up the camera. My mom actually took the only picture I have. Thanks, Mama! Next up was my sister's progressive dinner party. She fixed baked ziti, garlic bread, and a side salad. For dinner, we had her signature homemade gingerbread cookie sandwiches and chocolate chip cookie sandwiches. Grandma loves up on Britton. Unlike my house, Amber's was decorated for the Christmas season. Oh, the things you can do when you don't have a six-month-old who eats everything in sight. Amber and I have the same Spode collection. So, pretend that this picture is of a place setting at my house (since I didn't take any picture of the tablescape at my dinner). Is it time for dinner yet?! My grandma had the next day (Christmas Eve Eve) and she had steak and gravy, a speciality of hers. Again, major fail, as I let my stomach do the talking...no pictures. Finally, the series ended on Christmas Eve, when my parents hosted all of us for a post-church dinner. For those of us not allergic to shellfish (i.e. everyone but me), crab cakes were the star of the dinner. For moi, steak was a delicious main course. We also had veggies, salad, bread, tea, and leftover cookie sandwiches. Work with the group of people involved to assign dates for each person/family. Around the holidays, this can get a bit tricky since you're juggling office parties and other gatherings. The sooner you can set the dates, the better, so you can work around the Progressive Dinner with later plans, and not the other way around. Keep the gathering small. Since there are lots of logistics to consider when organizing something like this, you'll want to keep the group to 8-10 people or 3-4 families. Any more than that, and you'll likely run into issues with space and timing. Set the menu. It's worth coordinating with the other participants, so you don't end up eating roast four times in a row. Be upfront with allergies, dietary restrictions, or food dislikes. 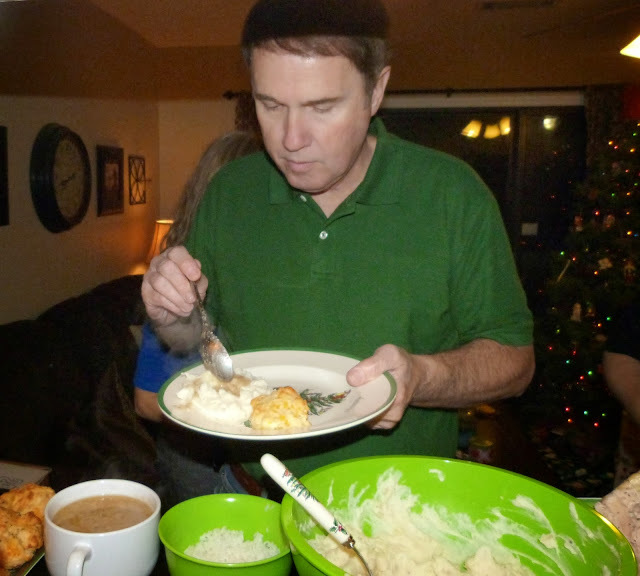 Between my shellfish allergy, my grandmother's dislike of anything that's not Southern cooking, and my sister's aversion to cream cheese and mayonnaise, choosing a meal is sometimes difficult. But it can be done! I usually make two possible menus, and then run both by everyone coming. It's usually pretty easy to spot the winning menu. Send out an email with date, time, and dress code. We usually keep things pretty informal since its just my family, but you could definitely choose to dress up or theme your section of the Progressive Dinner. Just have fun with it! *These would work for a traditional one-night-only progressive dinner or a Christmas progressive dinner extravaganza like we host. Do you do anything special for your Christmas dinner? Do you have any fun recipes that I should try for next year's dinner?